With the development of wavelength-division multiplexing (WDM) technology, the network traffic volume is increasing and the demand for more network bandwidth is also on the rise. 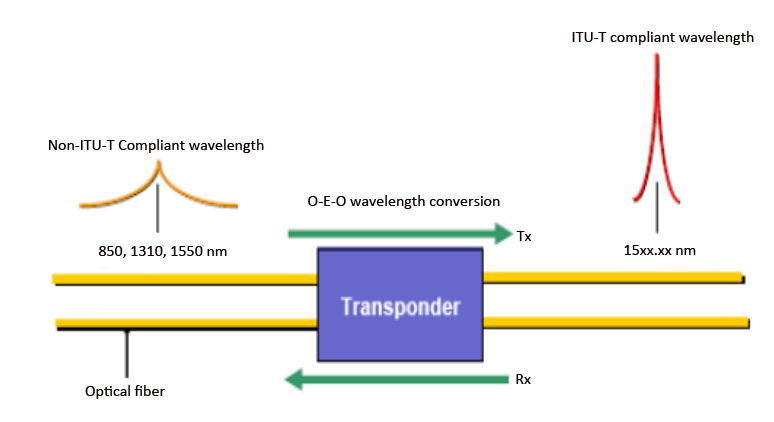 By converting the operating wavelength of the incoming bitstream to an ITU-compliant wavelength, WDM transponder serves as a key component in WDM system. As an important technology in the fiber optical network, WDM is moving beyond transport to become the basis of all-optical networking. And how to optimize WDM network has always been a hot topic. The transponder is a device to optimize the performance of WDM network, which plays an important in the whole system of WDM network. This article will introduce you the information on WDM transponders. Also called as an OEO (optical-electrical-optical) transponder, a WDM optical transponder unit is an optical-electrical-optical wavelength converter, which has been widely adopted in a variety of networks and applications. The picture below shows us how a bidirectional transponder works. In this picture, the transponder is located between a client device and a DWDM system. 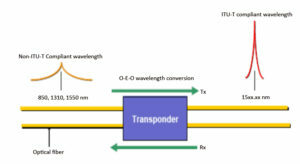 And we can see clearly that, from left to right, the transponder receives an optical bitstream operating at one particular wavelength (1310 nm), and then converts the operating wavelength of the incoming bitstream to an ITU-compliant wavelength and transmits its output into a DWDM system. On the receive side (right to left), the process is reversed. The transponder receives an ITU-compliant bit stream and converts the signals back to the wavelength used by the client device. According to its function, the application of a WDM transponders can be classified into the following types. Wavelength Conversion. 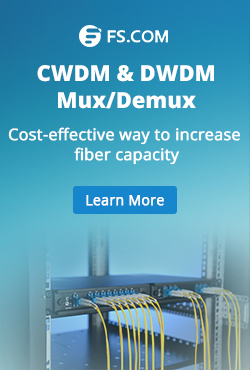 It is known to us that when a CWDM Mux/Demux or DWDM Mux/Demux is added into a WDM network, there is a requirement to convert optical wavelengths like 850nm, 1310nm and 1550nm to CWDM or DWDM wavelengths. Then the OEO transponder comes to assist. The OEO transponder receives, amplifies and re-transmits the signal on a different wavelength without changing the signal content. Fiber Mode Conversion. Multimode fiber optic cables (MMF) are often used in short distance transmission, while single-mode fiber optic cables (SMF) are applied in long optical transmission. Therefore, in some network deployment, considering the transmission distances, MMF to SMF or SMF to MMF conversions are needed. WDM transponders can convert both multimode fiber to single-mode fiber and dual fiber to single fiber. Signal Repeating. In long haul fiber optic transmission, WDM transponder also can work as repeaters to extend network distance by converting wavelengths (1310nm to 1550nm) and amplifying optical power. The OEO converters convert the weak optical signals from the fiber into electrical signals, and regenerate or amplify, then recover them into strong optical signals for continuous transmission. At FS, OEO transponders are made into small plug-in cards to be used on the FMT platform. FMT platform makes devices like EDFA, OEO, DCM, OLP and VOA into plug-in cards and provides standard rack units as well as free software to achieve better management and monitoring. In addition, FMT series products like OEO, DCM and OLP also have higher performance than that of old ones. FMT series OEO transponder can convert optical signals into DWDM wavelengths, reducing the fault risk caused by high power consumption of DWDM fiber optic transceiver. Since the OEO transponder is made into small plug-in card in the FMT platform, it only occupies one slot in the special designed chassis when installed, thus saving a lot of space. In addition, all these FMT plug-in cards, including OEO, in a rack unit share the same power source and support hot plug & play operation. 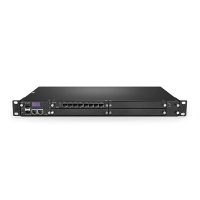 And they can be inserted or removed flexibly in the racks for DWDM networking. Since the OEO or WDM transponder plays an important role in WDM network, such as receiving, amplifying and re-transmitting the signal on a different wavelength, adding an OEO transponder into the WDM network is very essential. The OEO transponders in our FMT series are made into small plug-in cards with high quality to ensure good transmission performance. For more information on our FMT system, please visit www.fs.com. This entry was posted in Optical Transponder and tagged OEO converter, optical transponder unit, WDM transponder, WDM Transponders on July 14, 2017 by Admin. Optical signals are transmitted on specific wavelengths like 850nm, 1310nm, 1550nm and CWDM wavelengths and DWDM wavelengths. In some cases, it occurs that you need to converter a wavelength of optical signals into another wavelength for transmission. A useful component OEO 3R converter is suggested to be used. The OEO converter is also known as transponder OEO. This component uses the Optical-Electrical-Optical principle to offer the conversion between different wavelengths of optical signals. “3R” means re-timing, re-shaping, and re-amplifying. OEO 3R converter can fit various applications and can be installed in the network flexibly. It is a very popular component in DWDM and CWDM networks. In many situations, we are using fiber optic transceiver that working on 850nm, 1310nm and 1550nm for optical signal transmission. However, if you want to add optical signals of these wavelengths into a CWDM or DWDM network, you should firstly convert the wavelengths into CWDM or DWDM wavelengths. With OEO converter, this could be easy. The following picture shows a case which uses OEO converter in a CWDM network for wavelengths conversion. In this case, a 10G SFP+ to SFP+ OEO with two SFP+ ports, is being used for wavelength conversion between 1310nm and CWDM wavelength 1610nm. 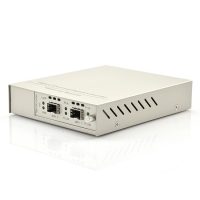 A 10G-LR SFP+ module working on 1310nm is used in a 10G switch on site A. 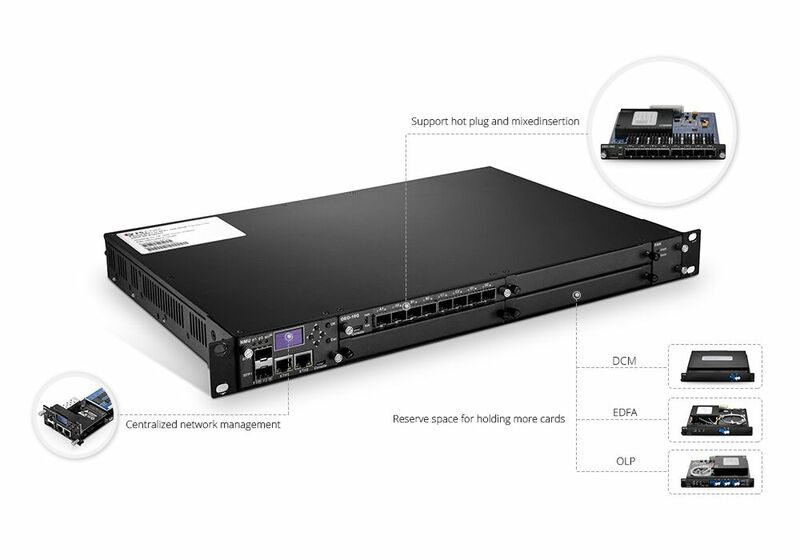 To add the optical signal of this port in to the existing CWDM network, this module is being connected to another 10G LR SFP+ module which is being inserted in the SFP+ Port 1 of the OEO converter. A CWDM 1610nm SFP+ module, connected to the CWDM MUX/DEMUX on site B, is being used in the other port of this OEO converter. The OEO converter the 1310nm signal into 1610nm CWDM signal. The optical signal from site A is being added into the CWDM network via the CWDM MUX/DEMUX on site B. The using of OEO converter for wavelength conversion is simple. 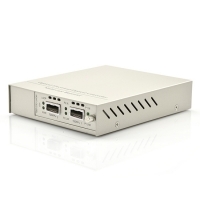 As above mentioned, the OEO 3R converter has the function of re-timing, re-shaping, and re-amplifying, the OEO 3R converter can also be used as fiber mode converter and fiber repeater converters. The following picture shows another case with OEO 3R converter working as fiber repeater and providing conversion between single-mode and multimode. In this case, three SFP+ to SFP+ OEO converters are deployed between Site A and Site B for long distance dual-way optical transmission. The optical signal from Site A is firstly converted from multi-mode fiber into single-mode fiber for 90km transmission by one OEO converter. Then, a second OEO converter is used as a repeater to “3R” the optical signals. After that, the single-mode signal will travel another 75km. Before the signal reaches the switch in Site B, another OEO converter converts the single-mode signal into multimode signal. OEO converters provide flexible solution for optical transmission network. 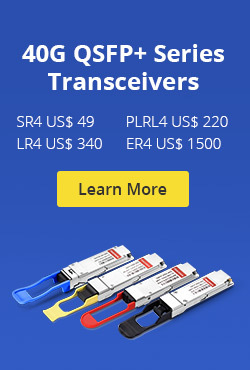 Except the above mentioned 10G SFP+ to SFP+ OEO converter, there are many other OEO converters with different port types, port counts and designs. The following table listed several OEO converters for your reference. This entry was posted in Network Solutions, Optical Transponder, WDM Optical Network and tagged OEO 3R, OEO converter, SFP+ to SFP+ OEO, WDM transponder on March 9, 2017 by Alice Gui.